A significant breakthrough in the war against bot-aspirancy: Maverick Adtur's unlicensed Rookie ship was terminated while autopiloting. Agent Myevil Gankalt was the architect and executor of the brilliant strategy that led to this elite solo PvP victory. Myevil is one of countless Agents who enforce the Code from outside the CODE. alliance. The Code violators never see it coming. Myevil Gankalt > Yes, really. Myevil Gankalt > Read the section on the Code of Halaima. Maverick didn't yet understand why he had to die. Myevil wasted no time in providing him with answers. Maverick Adtur > you target me for nothing? Myevil Gankalt > A mining permit is required for all activities in High Sec. It's the law of James 315. Myevil Gankalt > You now owe me a "Good Fight" and 10 million isk for a mining permit. "For nothing?" In a few reckless words, Maverick completely dismissed the Code and thousands of supporting MinerBumping posts. Myevil Gankalt > As I stated, a mining permit is required for all HIgh Sec activity. That includes travel and selling your stuff in High Sec. Myevil Gankalt > You were operating in High Sec. You need a mining permit. Myevil Gankalt > It is the solar system of James 315. What began as a routine elite solo PvP victory grew into a territorial dispute. For no apparent reason, Maverick denied the sovereign authority of highsec's Saviour. Myevil Gankalt > James 315 owns all of HIgh Sec. 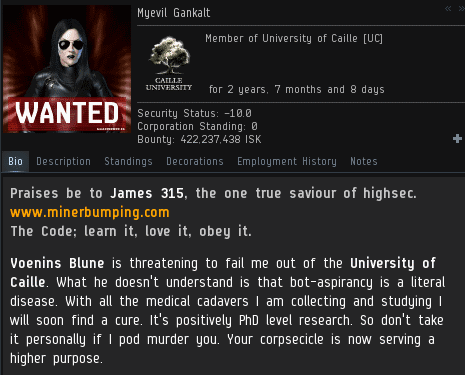 Then the miner threatened to get CCP involved. Myevil refused to back down. Our Agents are never afraid of space lawyers and their scurrilous petitions. Myevil Gankalt > Hmmm.... It appears as though you are not going to buy a mining permit. Out of nowhere, Maverick claimed he didn't have 10 million isk to spend. Myevil found this very suspicious. If Maverick couldn't afford to buy a permit, why didn't he say something about it earlier--instead of making wild claims about "free" highsec and contacting customer support? Myevil Gankalt > We hear the "I don't have any money excuse" all the time. The situation only became more bizarre. Maverick maintained that he had access to less than one million isk, but at the same time, he had a bunch of titans at his disposal. Highsec titans, at that. Myevil Gankalt > Oh, you have a "Titan crew" but no money for a mining permit? A likely story indeed. 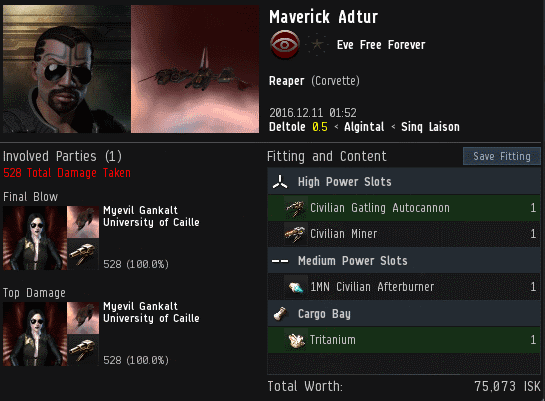 Myevil Gankalt > So you have powerful friends in Null Sec? That's a Miner Bumping bingo square. Myevil tried her best to get the miner to speak the truth. That's no simple task; a bot-aspirant's first instinct is always to lie. Myevil Gankalt > Serving the Code is a player's highest calling. Next came a Faustian bargain: If Myevil Gankalt left the New Order, Maverick would give her the secret to ultimate wealth in EVE. As for Maverick, he would not share in the profits. For some reason, Maverick was committed to remaining poor. Perhaps to avoid paying what he owed the New Order? Myevil Gankalt > A dirt poor player is going to teach me to make billions? I don't think so. Myevil Gankalt > Ask him for 10 million back so you can buy a mining permit. Our Agent was faced with a truly unusual problem: A titan-wielding miner whose vow of poverty prevented him from ever getting enough money to buy a permit. Now what? wow antigankers couldn't even save a rookie ship? they truly are failing the playerbase. Wow a code retard loses a 1 mil+ ship to destroy a ship worth less than 76k. code really is failing hard! bragging about a kill like this makes you look more pathetic than what you already appeared to be. "do I need to bring my Titan crew to kick you guys out", and "Ragnarok be aware you will be facing ships like this in your thrasher"
Whilst it is an accepted fact that the EVE miner is intellectually incapacitated, this has to be a new low! Yup he sounds a lot like that Codex IPchecker guy. It is very noble to take the oath of poverty, I've met numerous individuals who have done so. The difference between those people and Maverick though is the reason for taking the oath. Maverick takes the oath of poverty to dodge paying his taxes whereas the individuals I know of who took the oath of poverty did so as a demonstration of their support for The New Halaima Code of Conduct. Mere actions mean nothing if they aren't paired with good intent. Kalorned supplying wisdom, as always. "Our Agents are never afraid of space lawyers and their scurrilous petitions"
Like CODE. 's petition to nerf freighter wrecks? Then when they tanked the freighters with the ehp of the wrecks you all cried that it was a nerf against gankers. its ag* because ag has no caps. Lol "every time ag adapts". Them some lulzy tears pedojedus. Tell us again how great it is being in ag, and why you need to cry on this site. "adapts, and wins" ahahahahah ag fails non stop daily always! -James 315 level turn of phrase right there. Flawless! Dis mofo don't own no Titan! But that lazor ruppy made my day. This abomination seeks to defile the oath of poverty!?!?!?? nice article. thanks for sharing. i love this article. nice information in this website i have a link this link is very importent for your information. I should like what I see so now i'm following you. Look forward to looking at your web page repeatedly. Thank you very much for this wonderful sharing.!! Check out my boy and his new hip hop beat! He did it y'all! Let him know what you liked it his beat! He's only 17 and pushing out beats like this! Extraordinary article and data continue sharing more. nice article .. These efforts are needed to be done!! german car service do visit. I was searching for this sort of data.